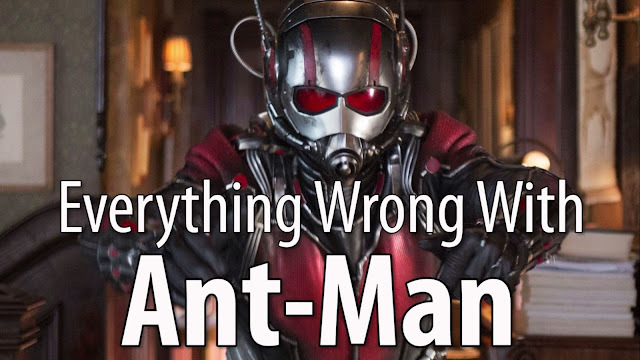 Cinema Sins has released their latest video of "Everything Wrong with..." and their target this time is Marvel's 'Ant-Man.' Apparently, there is so much material available it takes 19 minutes to cover it all. Granted, all the points aren't huge plot holes or entirely ridiculous but there are enough things to point out, nit picks and all, that will make you rethink the film altogether. In all honesty, I thought 'Ant-Man' was just okay. A serviceable if not predictable "heist film" that introduced Marvel's tiny hero. Paul Rudd seemed sedated though and whose usual charm was mostly missing. If it were not for Michael Pena's flashback voiceovers the movie would have lacked a lot of humor. I would have rathered Marvel made the 'Black Widow' movie fans had been demanding or made Evangeline Lilly's Janet Van Dyne as the Wasp the star since she was vastly more qualified than Rudd's Scott Lang character. Yet, the film was a major success amassing over $500 million in worldwide box office receipts. It just goes to show that Marvel Studios is pretty bulletproof right now and even mediocre fare like 'Ant-Man' and 'Thor' can draw filmgoers in droves. So what do I know?